1914-15 Star “236 Dvr. G. MacKay, Can: Fd. 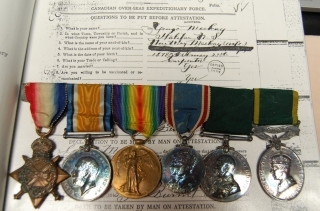 Art:”; British War and Victory medal pair “236 Gnr G. MacKay, C.G.A.”; 1937 Coronation medal; Colonial Auxiliary Forces LSGC medal (Geo V) “L/Sgt. G. MacKay, 1st (Hfx) Regt. 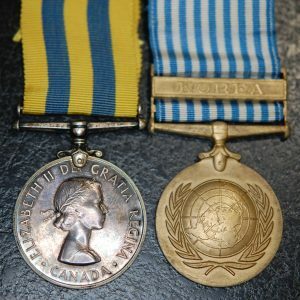 C.G.A.”; Efficiency medal (George VI) Canada “Bty Q.M.S. G. McKay, R.C.A. (N.P.) Note spelling on surname on Efficiency medal. With extensive service records and research files. George MacKay was born in Halifax, Nova Scotia. 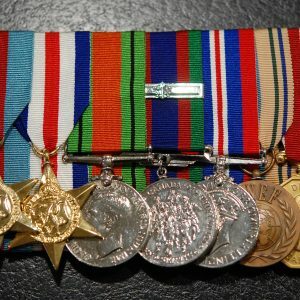 He served for 17 years with the Canadian Artillery. He enlisted with the 2nd H.V. Batt. Amn. Column. George MacKay was discharged from the C.E.F. May 1919. He had served in France. He then joined Canada’s Permanent Force #2779734. He enlisted with the Special Guard, Canadian Military Police Corps. in 1919. 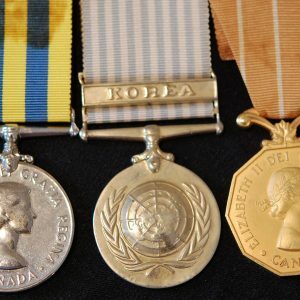 Colonial Auxiliary Forces medal confirmed. MacKay died in 1953 at the age of 77 years in his home at 84 Cedar St. Halifax. 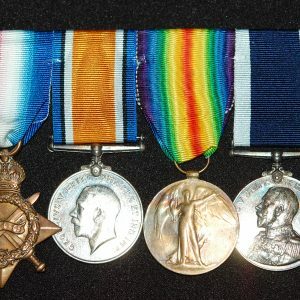 Medals swing mounted, with original silk ribbons, as worn. Nicely toned. With lots of great research.